A lawsuit targets the Clackamas County Jail after the death of inmate Bryan Perry in 2016. Clackamas County jailers laughed, joked and recorded cell phone videos instead of providing adequate medical care to a man who was fatally overdosing on methamphetamine in 2016, a lawsuit alleges. The videos, which have been made public, show inmate Bryan Perry "moving uncontrollably" and making "unintelligible noises" inside a high security padded cell inside the jailhouse while wearing only a t-shirt and underwear. Before the spasming began, the 31-year-old told authorities that he had taken heroin, meth and bath salts, according to a lawsuit filed in federal court for the District of Oregon on Oct. 2. The 38-page suit primarily targets Corizon Health, the Tennessee-based company which has been paid about $2.4 million per year to provide health service at the Clackamas jail since 2011. The two videos, each about one minute in length, record the deputies joking that Perry would be a suitable "show and tell" example for the drug prevention educational program known as DARE. "You could just wheel him in in a cage and wheel him back out," says a person identified in the lawsuit as Deputy Ricky Paurus. "Just let him sit there for, like, ten minutes and then 'don't do drugs' and then wheel him back out," responds Deputy Lacey Sandquist, according to the suit. "Has he tried to eat anybody's face yet," another jailer asks as Perry continues to wail. Deputy Matrona Shadrin adds: "I wish we could show this to his girlfriend like, 'You love this?'" In a statement, Clackamas County Sheriff Craig Roberts condemned the "callous comments." "The laughter, substance, and tone of several comments heard from my employees in that video were inappropriate, and do not conform to our professional standards," Roberts said. "My office has already taken action." The sheriff said disciplinary action had already been taken against the involved jailers who remain his employees. Deputy Shadrin, who filmed the videos, has reportedly resigned. 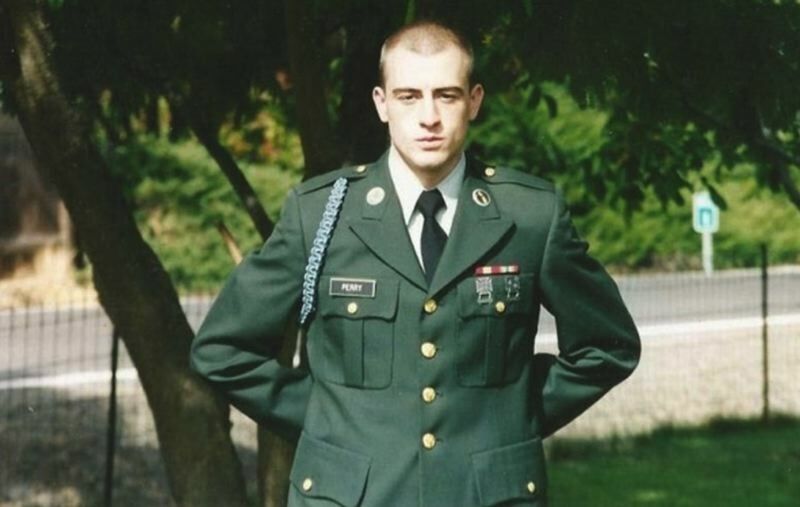 Bryan Everett Perry — a Portland resident who was honorably discharged from the U.S. Army after receiving a Purple Heart during Operation Iraqi Freedom — was picked up on a drug use parole violation after he was spotted walking through Eastport Plaza around 6:30 p.m. on Nov. 3, 2016, according to the suit. His girlfriend, Bridgette Mountsier, was arrested at the same time. Perry died roughly five hours after he booked into the jail at 7:15 p.m. The cell phone videos were recorded at approximately 7:40 p.m., and Perry's rapid uncontrolled movements continued until 11:07 p.m, according to the suit. Nurses and deputies began life-saving measures to counteract cardiac arrest around 11:20 p.m. after apparently noticing that Perry had stopped thrashing. Perry was declared dead at Kaiser Sunnyside Medical Center shortly after midnight on Nov. 4. An autopsy recorded the cause of death as methamphetamine toxicity. Mountsier was transported to the same hospital around 9:30 p.m. that night after she exhibited similar symptoms. She survived. Federal health standards require that inmates be medically cleared before entering jails. The standards note that "highly intoxicated" people may need to be sent to off-site emergency rooms. Several jailers wrote that Perry was not combative or refusing to cooperate but simply could not control his body during his final hours. It took five deputies to hold Perry down in a chair during intake procedures inside the jail, according to the lawsuit. Nurses attempted to take his vital signs on several occasions, including a two-minute visit inside the cell at 7:55 p.m., a three-minute interaction at 9:16 p.m. and a visual check at 10:47 p.m. Earlier in the day, Perry discussed his military service and his plans to take a welding class at Clackamas Community College with the Oregon State Police detective who was transporting him to the jail. "Look at me. I'm a mess. I don't like this lifestyle," Perry told OSP detective Matthew Fromme, according to the lawsuit. The sheriff said he could not comment on pending litigation.